Traditionally found in the kitchen, our breakfast corner nooks can also be a great addition to a dining room, living room or even a family room. They are excellent for many places of business or restaurants as well, and can be used for much more than sharing meals. Many people use our nooks for work, crafts, or playing games. Breakfast nooks can be a fabulous alternative to formal dining - presenting an informal and casual setting for friends and family to enjoy spending time together. This traditional breakfast corner nook features a trestle table and trestle bench, convenient and space-saving storage, comfortable seating, strong durability that comes from solid wood construction and Amish craftsmanship, a beautiful finish in your choice of a wide range of stains, and a gorgeous, traditional design that exudes both beauty and functionality. Made for a corner space, our nooks are space-saving heirloom treasures. The corner nooks from our Amish Valley Collection are made in America. They are built in Indiana, by an Amish craftsman and his sons who have been specializing in breakfast nooks for many years. You'll notice the superior craftsmanship in each detail. The nook is something of a work of art, built with integrity, skill and a little love. What better way to incorporate these traditional values into your dining experience than a corner nook? 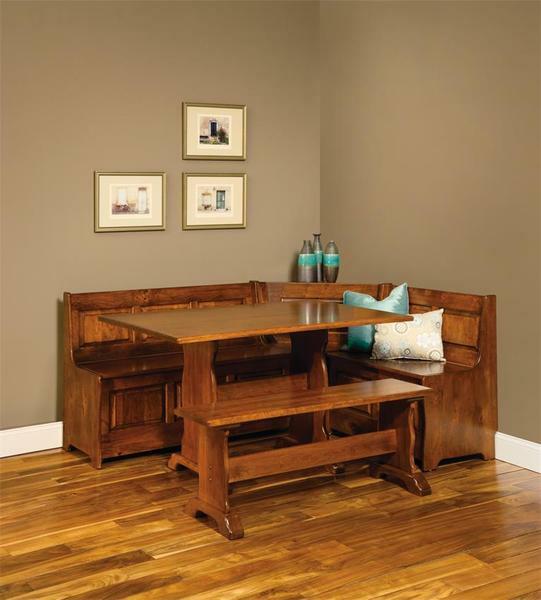 Share a meal, gather with friends, play a game and give thanks on a solid wood, Amish made corner nook! Questions? Want stain samples? Need customization? Prefer to place your order with a live person? Give us a call to speak with one of our friendly and helpful furniture specialists, who are also knowledgeable about our corner nooks and all of our dining room furniture and kitchen furniture. You can also stop in our Amish furniture store in Sarasota, Florida. Some easy assembly is required for this Amish solid wood breakfast nook set. The 34" Bench and 48" Bench Have a Lift Lid that Opens to a 6" Storage Area and one Soft Close lid Support. The Benches and Corner Piece are Fastened with six Connector Bolts Three on Each Side. Custom Sizes are Available Upon Request as Well as Individual Item Pricing. Some assembly is required. The backs of the nooks are stained but have nail pocket holes and are made to go against the wall. Call one of our Amish furniture specialists for a custom finished back. My furniture is beautiful and I love it. DutchCrafters had the best prices around and was great to work with when getting samples and ordering my breakfast nook and table. There were a couple of very small problems with the furniture from the furniture maker, but DutchCrafters answered immediately and took care of the problem. I will definitely order from them again. Our kitchen nook arrived - it looks great! Your company, Dutchcrafters, was easy to work with and delivered furniture ahead of schedule. The delivery option with in-home installation was worth the price - very professional driver and he arrived exactly when he said he would. It was made in Indiana and that makes me feel wonderful - a Hoosier nook! The quality of the wood benches/table/free standing bench is superb. The brown maple is a nicely weighted wood, the finish looks very close to the sample you sent, and the overall feel of the wood is smooth and substantial. I am so glad I didn't pay extra for the finer maple. This brown maple works just great with the darker stain. Your advice was very much appreciated. I sent an email to the interior designer I was working with who helped me find your company, Laura Fischer at Fisher Design, LLC. If she ever has a client looking for quality wood products, I am sure she will look to your company again. We are all very happy!